Do you ever hit a point on a project where you are completely stumped? Where it seems as if every path leads to a dead end? I definitely know the feeling! In times like those, I often feel much more productive when I leave the project for a moment, and then come back at it with fresh eyes. During these breaks, I tend to eat a snack, talk to friends, or do something creative. I try to forget about what is stumping me in order to have a fresh view of the situation when I sit back down at my desk. The idea behind a break is to get your brain thinking in a different manner than it was before in order to bring about new ideas and productivity, which is why taking breaks is always a tip suggested to people who want to have more productive meetings. Unfortunately, these breaks often turn into an extension of the meeting, with attendees returning calls or checking their emails. So how can you make your meeting breaks worthwhile? MeetingsNet suggests that meeting breaks should be used to power up your team with productivity, creativity, and positivity! They give many ways this can be done such as having a dance party, grabbing some caffeine, snacking on trail mix, and even comedy. We added elements to the design of Think Space to make these break ideas easy. 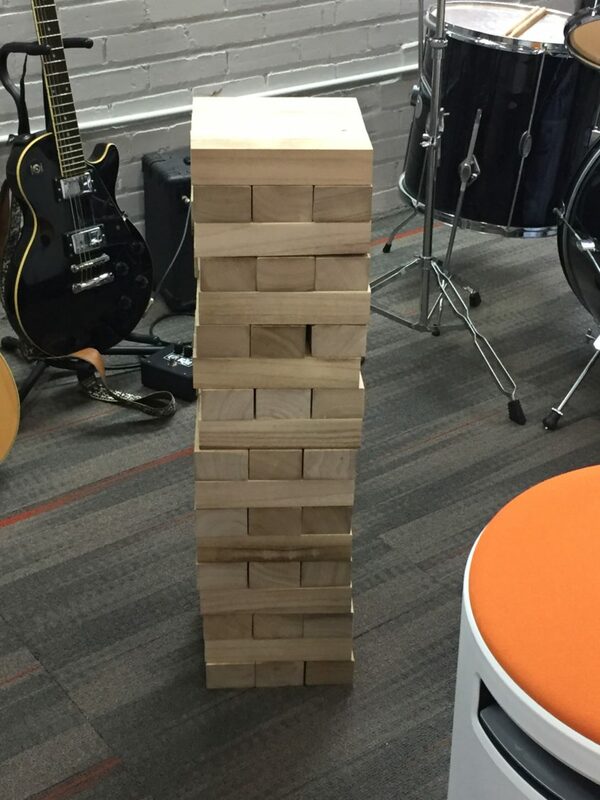 For example, we have a “fun zone” with drums, guitars, and games (including life-size Jenga blocks). So next time your meeting seems to be hitting a brainstorming roadblock, take a break! Try one of MeetingsNet’s 15 ways to power your meeting breaks. Take your group for a walk, go on a scavenger hunt, or maybe meditate! Ensure the productivity and creativity of your meeting’s future by taking a purposeful, powerful break.